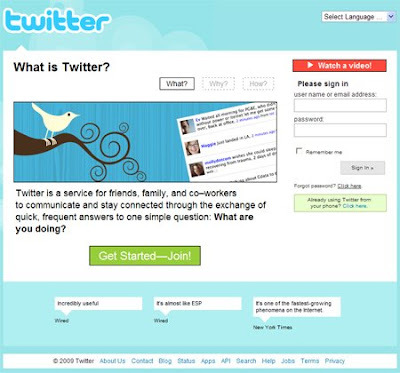 Twitter launched their new homepage today, which focuses on searching and Trending Topics. The search bar implores of visitors to “See what people are saying about…”. Below the search bar, a cloud of the most popular topics being talked about on Twitter is featured. Oddly, there is a phrase that says “Most popular topics by the minute, day and week”… however, I’m not sure how to narrow them down by those time frames. Yesterday, Chloe Sladden, director of media partnerships at Twitter, gave a lecture on the future of Twitter. One of the upcoming changes she mentioned was a new homepage that focuses on searching the content of the site. Well, I didn’t see it coming so soon! Congrats, Twitter!